It’s the physical working with my hands in the dirt. When I walk out into the garden at the beginning of spring, weeds are growing already. I take the hoe to the ground and uproot them. 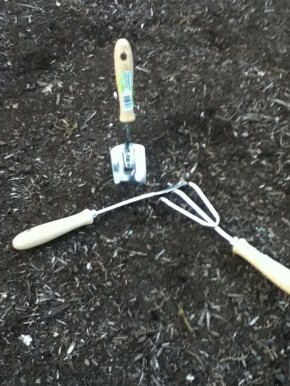 With a spade, I define the parameters of the space where later I’ll run the tiller through the soil. I think and pray while I garden. When I’m uprooting weeds I wonder, “What needs to be uprooted in me?” or “What needs to be uprooted in my community?” When I uproot the weeds, I make way for new growth and fresh possibilities. When I’m defining the space, I begin to think spatially. I think, “What needs to be rearranged or redefined?” or “What spaces in my life constrain me?” I explore what else in my life needs to be cleaned out and defined. I think about the soil, the dirt. I think about how in order for growth to take place, my hands need to get dirty. I think about what trauma the soil endures to be tilled and aerated to be open for the seeds of new life. And I reflect on how at the end of this day when I’ve simply weeded the garden and defined the space, there is nothing to show for it except an empty space. But my work was not unproductive or wasted. On the contrary, I worked in expectation. I expect the sun to shine and the rain to fall. I expect the frosty nights to make way for warmer temperatures when I can till the soil. And then after I till, I’ll sow. But even then, I don’t have sweet, juicy tomatoes. All I have is nice, aerated dirt. Just talking or thinking or researching what Jesus means in this parable doesn’t always inspire or guide me. But when I physically do the work of gardening, these words begin to make more sense to me. I sense God’s presence when I garden. I’m slowing down and taking my time with the work of weeding and tilling. I’m aware that not all the work of gardening will be done in one fell swoop (a lesson I’m learning more and more as a reality of life). I begin to see connections between the work that I do with the dirt and the work that I do elsewhere. We’re exploring how God calls us to lives of simplicity and balance. Gardening for me is one of those ways that simplifies my household’s grocery list during the warmer months but also gives me a chance to pray and meditate and to strike a balance with the rush of daily living. But mostly, I garden because I like dirt. Posted in Simplicity & Balance. Tagged with balance, gardening, simplicity.